This weekend, I headed to Shuri to visit Kyoko Nakamoto, one of Okinawa's most talented painters and founder of Kyokoart. Kyoko's artwork is very original and very Ryukyuan. 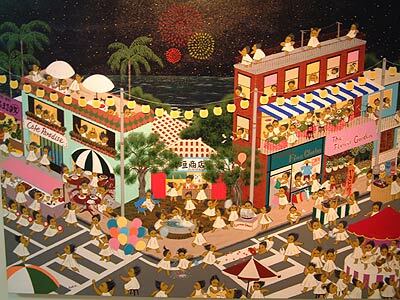 It falls into a genre known as naive art. Naive is a French word for sensitive and simple, and naive art is homegrown--a very rare genre in Japan. Prior to accidentally finding Kyokoart about two months ago, I had never seen artwork like that which has been done by Nakamoto. Her paintings are full of life and energy. They are noisy, but in a childish, fun manner. Each painting has an everyday setting. In one series of two paintings, a small town is preparing for an Okinawan festival complete with a yakitori (chicken on a stick), eisa, and other Okinawan entertainment, while in another picture a group has gathered to enjoy Okinawa's slow lifestyle at the beach. One distinct feature of each of Nakamoto's paintings is that the characters shown are all similar looking and wearing a white dress. I was a bit confused about this when I first noticed. "The girls in white dresses represent me in my childhood," says Kyoko. "They are my memory. They represent ageless, sexless human beings. I try to express a sort of paradise of living equally and simple lives. Sometimes we fight, but we should always be good to one another." Each of her paintings are distinctly Okinawan, but they are universal at the same time. The scenes shown in these paintings could take place anywhere. Kyoko has been fortunate to travel often and show her art at various exhibitions around the world. "All types of people come to these exhibitions and speak different languages and have different mindsets," she says. "Some people say, ' This looks just like my hometown,' while others are envious and can't believe places like this exist. They say, 'Is this the real color of the sky? What kind of sea is this?'" Okinawa's sea and sky are very beautiful and they are often emphasized in day and night settings in Kyoko's work. On January 7 through the 18th, Kyokoart will be on display at an exhibit in Chelsea, New York City during an international group show alongside paintings done by great artists from all over the world. So far Kyoko has done five exhibits in New York City. It is very good to see a local artist having such success in the international art world! A little closer to home, her work will be on display in the fourth floor of Palette Kumoji - Ryubo in Naha City from December 3 through 9. 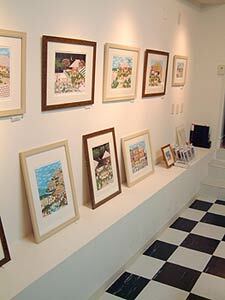 The Kyokoart gallery in Shuri opened one year ago last week. They recently held a one year anniversary party attracting local admirers from around the island. One of the highlights of the occasion was when Tazuko Miyara, an accomplished Okinawan classical soprano singer who performs mainly in mainland Japan, sang a few pieces. Both Miyara and Nakamoto went to highschool together, and their talent in the arts has been fine tuned over the years. "I had a nice anniversary party. Art collectors, artists, and everyday people came to visit. It was very nice," says Kyoko. "The last year has been very exciting. One thing I appreciate is that with the gallery I can exhibit my art all year round," she says. "Most independent artists can only display their work a few weeks every year, but I can show mine all year. My husband Sam stays here and watches the studio all day and I'm always painting. As I'm always painting, getting dirty with no makeup, I'm too dirty to be in the studio. But, I can come to the gallery if people call in advance." 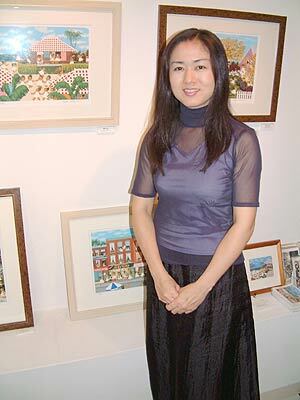 Kyoko Nakamoto started painting 20 years ago, 10 years for business and 5 years as a commercial illustrator graphic designer. She enjoys the painting as it is very natural. "Painting with my own hands is very nice and very comfortable," says Kyoko. "It's dirty, but I like getting dirty." Her first experience painting was very unusual to say the least. "My first experience painting was when I was two years old," she explains. "My mother was a funny person and allowed me to draw on the walls, floors, and doors of our house with crayons. She never got angry about it. I'm not sure what she was thinking but it was a very memorial thing for me. In 11th grade, I suddenly realized I wanted to be a painter but I thought it was too late. My parents said, 'You will never be a painter because you didn't study.' I didn't study the arts so I decided it was time to do so and go through with a plan to become a painter." After high school, Kyoko went to a junior college to study English. Later, she got into a big insurance company. Her plan was to earn money for three years, quit, and get into an art school, but she got married along the way and her plans got pushed back a bit. "I couldn't quit the company for ten years," she explained. "My plans kept getting extended." However, everyday, after 5 p.m., Kyoko went to a small art school to continue her dream of being a painter. It was here that she met her husband Sam fifteen years ago. The couple currently have three children: Daisuke (14), Tatsuro (11), and Makiko (8). "Babies take up a lot of time, but this is also a very busy age for us and our children," she says. "My weekends always fly right by." Sam also enjoys painting but more so as a hobby. He watches he gallery and maintains the website (www.kyokoart.com). Though studies and work at an insurance company delayed Kyoko from becoming a full time artist for many years, Kyoko says that every experience has helped her become the artist she is today. "I worked in the accident section of a big insurance company which was very difficult but a good experience," she says. "It was a very strict company and in this section I learned self-expression. Many Japanese are quite shy, but working there, I had to express myself. My English studies at college taught me English, and my insurance job taught me self-expression. Every experience of my life has been useful." Kyokoart is very bright and full of human life and energy. Each painting is outstanding. Kyoko's art is sure to endure on Okinawa. "I want to continue making these kinds of paintings," says Kyoko. If you would like to check out Kyokoart, the gallery is open from 11 a.m. to 8 p.m. everyday except monday and the fourth Saturday and Sunday of every month. The gallery has many paintings on display as well as mugs, post cards, t-shirts, and other items for sale. Driving to Kyokoart is fairly simple if you are a little familiar with Naha. If you are heading south on Highway 58, turn left at the Tomari Intersection. Pass the right turn for Kokusai and head straight through the Asato intersection. Continue straight and follow the road signs towards Shuri Castle. A ways ahead, you'll pass the historic Ryutan Pond on your right as well as the Shuri Public Office and Shuri Library. Across from the Shuri Library is an electric store called Trend Satuki. Turn left here at the light. Turn right on the small bridge, your first possible turn and Kyokoart will be in front of you on your right at the bottom floor of a large apartment building. For more information, call (098)866-1800.